Summary: Everglades National Park will construct and place approximately 50 three-foot square wire cages over sea turtle nests on Indian and Kingston Keys within the park to prevent predation by raccoons. Thirty or more turtle nests (primarily loggerhead) are found annually on Indian Key, and Kingston may have 20 or more nests, yet predation by raccoons is high and most of these nests fail (Cook et al. 2000). 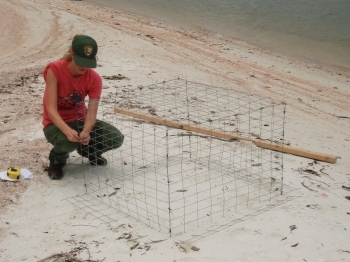 Beginning in the spring of 2006, the park conducted raccoon control activities on Indian Key. The control work appeared to result in increased turtle nesting success; however, it is labor intensive and eradication of raccoons appears unlikely, particularly on keys which closely adjoin other land. Raccoon exclosures offer a more time effective and ecologically preferable means of reducing raccoon predation on turtle nests. Beginning in the spring of 2007, the park will conduct weekly searches of Indian and Kingston Keys to locate turtle nests. Turtle nests will be marked and caged in accordance with the 2002 Sea Turtle Conservation Guidelines. The park will monitor these protected nests and provide this data to the Collier County Environmental Service Department. If the exclosures are effective, the park will continue this work in the future using the same exclosures and possibly expand the program to Tiger, Picnic and Pavilion Keys.